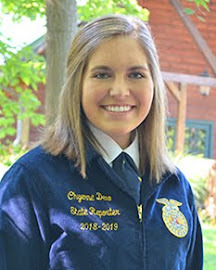 The Indiana FFA State Officers had the opportunity to attend this years Indiana Livestock, Forage and Grain Forum held at the Indianapolis Convention Center. There we had the opportunity to listen to Keynote Speakers in the morning session. First, we got to see Governor Mitch Daniels receive the Indiana Pork Meritorious Service Award. Then we got to listen to John Anderson of the American Farm Bureau as he presented the 2011 Market Outlook for Grain and Livestock Farmers. Following that report was the opportunity to hear a Keynote Address by Roger Thurow. Roger Thurow spoke about the contents of his new book, "Enough - Why the World's Poorest Starve in an Age of Plenty." Thurow recently returned from a trip to Africa where he stayed in Kenya learning how African farmers scratch a living off the land with there primitive farming methods. Following Thurow's keynote was a keynote by Jeff Simmons, the President of Elanco Animal Health. Simmons spoke of why agriculture needs technology to meet food demands in the future. A banquet lunch was held where we had the opportunity to discuss with various agriculturalists from across the state and hear their opinions in different agricultural issues. It was an honor to be able to attend this Forum. Each State Officer left motivated to share what we learned this morning and a little more educated about Indiana Agriculture. Whether it’s someone who is a fan of red tractors or green tractors, hundreds of people set aside their differences as they all came together this week for a one of a kind farm show. Ft. Wayne Indiana was a busy place the past few days, filled with individuals with an interest in agriculture. Throughout the week there were booths to visit, sessions to attend, equipment to see, and the FFA live auction to participate in. The Indiana FFA defiantly had a presence at the farm show having its booth location right at the entrance. 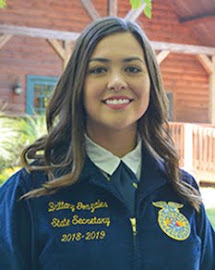 As they entered the farm show, people from all over Indiana, Michigan, Ohio and Illinois were greeted by the smiling faces of FFA members from across the state. Thanks to the many sponsors and donors, the Indiana FFA had a very successful live auction again this year which helped to support the Indiana FFA Foundation. 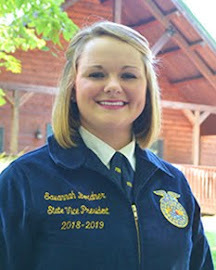 Whether it was selling truck tickets, the live auction, or the new “Get Connected” program, Indiana FFA is truly grateful to those who support our dynamic organization. Whether it's starting a business or committing to a New Year's resolution, it's said that the most difficult part of a task is beginning. Dr. Thorne, Superintendent of Westville Schools, was a member of DECA in high school. 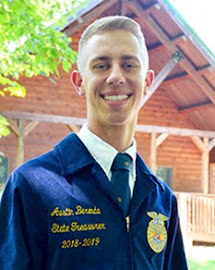 He knows firsthand the benefits of participating Career & Technical Student Organizations that have a lasting impact on one's personal and professional development. 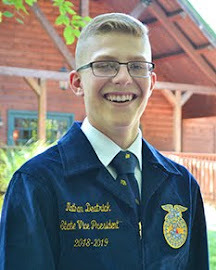 As a result of his experiences, he has actively pursued implementing agricultural education in Westville Schools. LaPorte County has strong agricultural roots. With that basis, it is only logical for the schools to have a strong foundation of young agricultural leaders. The challenge here... is beginning. 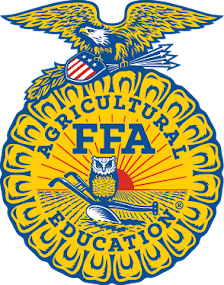 In the 2010-2011 school year, Westville High School Freshmen have all been enrolled in Fundamentals of Agriculture. All upperclassmen have been enrolled in Landscape Management. Just like any new mission, the pursuit of agricultural education at Westville came with a cost: the elimination of the woodworking, band and art programs. Like any major change in curriculum, this brought up much heated, constructive conflict within the community, and great challenges for the school board, Dr. Thorne and Mr. Walker, the educator who pioneered the strong Animal Science programs at Michigan City and is now pioneering a chapter in Westville. Enter the dynamic trio, Mr. Micah Matlock, Mr. Steve Hickey, and myself. As spokespeople of the benefits of FFA, we went into Westville to speak to three of Mr. Walker's four agricultural classes, which many of the students had referred to as "Farming 101". 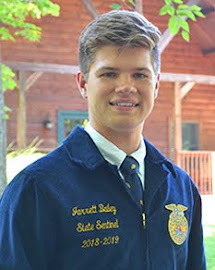 From the high energy freshmen, to the gifted and talented, to the seniors with interests in the military and veterinary science, ideas were sparked and questions were asked about what FFA does, offers and promotes. 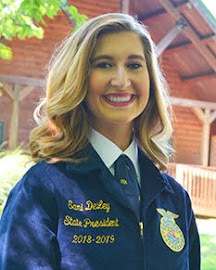 In addition to the Beef Jerky Fundraiser, sizeable grants from local sand dune preservation organizations and an upcoming Wild Game Banquet tailored specifically to many wildlife, hunting and meat processing interests within the student body, Westville High School will be holding their first FFA Call-Out meeting next week. As we traveled the halls of this fresh, motivated school we noticed a pristinely folded American flag and a letter from a soldier on active duty in Afghanistan. The high security correctional facility not too far from the high school employs many veterans of the war in Afghanistan, and consequently Westville is educating many students with strong military families. The calm and orderly fashion with which the students moved through the halls, the pleasant ways they regarded us as visitors and the common sense many of them exhibited are, in my mind, no coincidence with the backgrounds they possess. Major Jeremy Gulley, principle of a progressive agricultural education program here in Indiana, is on active duty in Afghanistan in support of Operation Enduring Freedom. He's supporting agricultural education in Khost Province, Afghanistan, and is seeking teachers to share their best project ideas to provide Afghan youth with hands-on, practical application agriculture experiences. There is an undeniable potential for Westville High School's agriculture program to put itself on the map with this initiative. We look forward to fostering the development of this program, and stimulating the Infinite Potential contained within it. Beyond that, as we are halfway through the year to impact together, we are more than ready to implement the Mission of our Organization on as many levels as possible. Luckily for us, we have already begun.